Simplistically, the Taconic orogeny occurs when a terrane or series of terranes (volcanic arcs and microcontinents) collide with eastern North America along an east dipping subduction zone: Stage G to this stage. Because subduction is dipping eastward it acts like a ramp, and the terrane when it hits is forced to slide up onto and over the continental edge (along the "suture zone" in the cross section at the top) forming the Taconic mountains. As the mountains rise up the craton to the west is pressed down into a deep-water foreland basin. The overriding terrane that forms the mountain is the hinterland. The mountain erodes and sediment from it fills the foreland basin right to the top. By the time the basin is full the mountain is completely eroded to sea level. The former mountain, is now flat, featureless, and stable (Stage I). The terrane is solidly welded to North America. The orogeny is over. The cross section at top illustrates the collision at full force. The Taconic orogeny is, in fact, a more complicated affair, for several reasons. First, the eastern edge of the Cambo-Ordovician continent was rifted into a zig-zag (Cambro-Ord. map). Parts like the Southwest Virginia High and the southeastern Pennsylvania promontory stick out, and get hit hardest. In between are protected reentrants where collision is soft. There is no way for something to collide with this coast line uniformly. Second, the Taconic terrane does not come straight on to North America. It approaches at an angle from the southeast (Pre-Taconic map) insuring it will not hit uniformly. Third, the Taconic terrane collides first in southwest Virginia and then a few million years later with southeast Pennsylvania. In effect the orogeny occurs in pulses and has different character in different places. It is also possible that the different belts that make up the Taconic terranes (piedmont belt map) came in and collided at different times (Stage G). The result of all this is the Taconic orogeny is complicated. The points of major collision result in major thrust mountains, probably as high as the Swiss Alps. But the areas in between (northwest Virginia and Maryland for example; Taconic map) are in a protected reentrant, and get squeezed, but not crushed. Deformation here is gentle folding into an arch that may never have risen above sea level. The Taconic orogeny has a lot of parts and pieces, and can be confusing. Below we just sketch the major processes; a fuller discussion is in the more details link at the bottom of the page. But the best way to understand is to continuously refer to the maps and cross sections. We link to them in the discussion, and the thumbnail images can be clicked to a larger version, but you may want to print them out for easier reference (Pre-Taconic and Taconic maps - pdf, and cross sections - pdf.) The pdf versions take longer to load but will print sharper images. The orogeny begins when the Taconic terrane converges on the Southwest Virginia High from the southeast (Pre-Taconic map). Along the western border of the terrane oceanic lithosphere is descending down a subduction zone, keeping the volcanoes in the terrane active (A-A'). Between the terrane and the continent edge is the Proto-Atlantic remnant ocean basin (ROB), quickly disappearing down a subduction zone. When it is gone, the continent and terrane collide. If you could have stood at the Southwest Virginia High promontory in the early Ordovician looking southeast you might just see the volcano tops over the edge of the horizon. Soon they will loom high, but until the actual impact North America feels only minor effects from the terrane and its volcanoes. Instead, carbonate rocks continue to flourish throughout the tectonically stable Mid-Atlantic region (Stage G). But even without seeing the volcanos over the horizon, if we were in Virginia in the early Ordovician we would have premonitions that something was about to happen. Carbonate rocks give no clue an orogeny is coming, but scattered in these rocks of the modern Valley and Ridge province are volcanic ash beds. In the early Ordovician eastern North America lies below the equator in the southern trade wind belt, and prevailing winds easily blow volcanic ash from the terrane in our direction where it settles across the shallow carbonate seas, long before the collision. Perhaps long before the volcanos can even be seen. As the last of the remnant ocean basin descends into the subduction zone the terrane finally collides with the Southwest Virginia high, sticking so prominently out into the Proto-Atlantic. With the collision the terrane becomes a hinterland, overriding the Southwest Virginia High along two thrust faults, the Haysville-Fries-Rockfish Valley (HFRV) fault, and a Taconic overthrust (C-C'). The HFRV fault is not new; it was active in the Grenville (Stage A), and is reactivated by the Taconic collision. These mountains were large and the thrust faults brought Cambrian/early Ordovician divergent continental margin rocks (Stage D), as well as terrane rocks up into the mountain to be eroded (C-C'). Inland from the first impact a foreland basin develops, the Bount. Actually there will be several foreland basins before all is said and done, so we deal with them in more detail below. But in C-C' you can see a foreland basin west of the HFRV thrust. A few million years after the first impact, the Taconic terrane wraps around and collides for a second time with southeastern Pennsylvania, building a second hinterland mountain. The Queenston foreland basin develops to the west in central Pennsylvania (Taconic map). Of the two impact sites, little is preserved of the one in southern Virginia; later events have masked or destroyed the evidence. The second impact is preserved, however, in Pennsylvania as a record of intense metamorphism and structural deformation, This is typical of what happens to foreland rocks that are shoved deep into the earth by an overriding hinterland. With the Taconic terrane now hung up on the two promontories it stops moving. In between the two collision points lies a protected reentrant, set back too far from the terrane to undergo major deformation (Taconic map). We know deformation was slight in the reentrant for a couple of reasons. The first is that the HFRV fault shows less and less reactivation the farther north we go. Somewhere north of Charlottesville it stops all together and if this was the only evidence we had we would have to say the orogeny never affected the reentrant region. The reentrant is not unscathed, however, and what does happen takes some understanding of subduction zone dynamics. Running in front of a subduction zone on the oceanic side of a trench is a peripheral bulge, an arch in the oceanic floor. This bulge is like a wave continuously running away from the front of a boat. In the Ordovician, as the terrane approaches, the bulge is the first thing to hit North America, and it slightly lifts the continent into an arch, moving like a wave inland. At the major impact sites we would see no evidence of the bulge, since it will be destroyed by the rest of the mountain building. But in the reentrant the bulge is preserved (stratigraphically; there is no actual bulge today) as the Little North Mountain arch. The arch divides the protected reentrant into two foreland basins, a Western Cratonic Basin and an Eastern flysch basin (Taconic map, B-B'). On the east side of the flysch basin the terrane is hung up and acts as a dam sealing the flysch basin off from the ocean on the other side. The Western Cratonic basin is continuous with the shallow Tippecanoe sea (Stage G) covering most of North America at the time, and it also merges north with the Queenston foreland basin. Note that now, with the collision, the Proto-Atlantic ocean has disappeared down the subduction zone. But there is still an ocean east of the terrane. It is the Rheic ocean. Just as today we divide up and name the seas (e.g. North Atlantic, South Atlantic, etc), we divide past seas to, only with plate tectonic movements we can completely lose an ocean basin. With the terrane stopped, the orogeny is now effectively over. No more mountain building can occur. The only thing that remains is for the mountains to erode, and the foreland basins to fill with sediment. But in the Taconic even this is not simple because we have two major sourcelands, one in the north and one in the south (not to mention the terrane blocking the opening of the reentrant), and several foreland basins. From the southern Virginia sourceland sediment spreads out in two directions. One is the Blount clastic wedge (foreland basin) spreading westward through southwest Virginia into Kentucky and Tennessee (Taconic map). The second is the Martinsburg flysch, traveling northeast, down the deep axis of the flysch basin, trapped between the terrane on the east and the Little North Mountain arch on the west. The Martinsburg flysch is made of very immature sediments (rich in feldspar and rock fragments) flowing as deep water turbidity currents (underwater avalanches) down the axis of the basin. These currents flow all the way to Pennsylvania where they stop at the high walls of the transform faults, piling up at their base as if they were hitting a dam. We might also expect a record of sediment flowing westward from the terrane into the flysch basin, but no such record exists. Inevitably some sediments must have come from there but the record is not preserved. From the Pennsylvania sourceland sediment flows westward into the Queenston foreland basin (clastic wedge) in central Pennsylvania. And from there it turns southwestward into the Western Cratonic basin of West Virginia. Some of it encroaches up onto the back side of the Little North Mountain Arch, but none is able to cross over into the flysch basin. Not until the very end, when the basins are full, and the mountains virtually all gone, will sediment spread from one basin into another. The end of orogenies in general, and the Taconic in particular are easily recognized in the rock record. Orogenies produce very thick accumulations of immature sediments. An immature sediment is one filled with easily weathered particles, feldspars and rock fragments. Because of rapid erosion they are buried too rapidly to weather much. But, as the orogeny ends the supply of immature clastic sediment wanes, and sediments return to non-mountain building types - carbonates and quartz sandstones. We already know that carbonates indicate tectonic stability (Stage E and G). But, pure quartz sand is "mature" and indicative of tectonic stability because quartz is the only mineral that does not weather. For a sediment to be pure quartz it must have the time for complete weathering of everything that is not quartz on a very low, stable sourceland. In the field we know mountain buildings are over and there is tectonic stability when quartz sand and carbonates appear in the record. The end of the Taconic orogeny is marked by the Clinch/Tuscsarora formation (and its equivalents like the Massanutten sandstone), an extremely pure quartz sandstone that blankets the entire Appalachian region from New York to Tennessee. 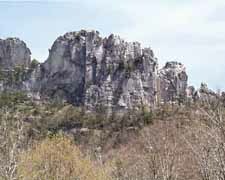 The picture to the right is the Tuscarora at Seneca Rocks, Pendleton Co, W.VA. It is a tough sandstone the holds up many ridges in the area. The maturity of the sandstone tells us the Taconic mountains have been eroded down to stability. It also tells us all the various foreland basins have filled in to allow the Tuscarora sand to spread more or less uniformly verywhere. To understand the Taconic orogeny, and the problems geologists have interpreting geologic history, there is one final issue we need to consider. After the Taconic orogeny comes two more, the Acadian (Stage J) and the Alleghenian (Stage K ). The Alleghenian in particular has a major impact on the Mid-Atlantic region. Virtually all the rocks in the region are faulted, folded and telescoped; shuffled like a deck of cards. The result is, virtually no Virginia rock is now located where it was originally, and rocks that originally were far apart may now be side by side. This is certainly true for the Taconic foreland basin rocks. Most of the geology on the paleogeographic maps we used in the history above is based on the present location of the rocks, especially for the Western Cratonic and Eastern Flysch basins. It implies these basins are closer together than they were originally. But we can get some idea of their true original locations from these Interpretive Cross Sections. The first (Pre-Taconian) cross section shows the Virginia divergent continental margin stretched out with all the subsequent folding and faulting undone. The second cross section (Taconian) shows development of the Western Cratonic and Eastern Flysch basins in the Taconic. Note the distance between reference arrows A and B. The third cross section (Alleghenian) shows how the rocks have telescoped together by folding and faulting. Note especially how the reference arrows A and B have moved close together, and how the Western Cratonic basin rocks (yellow beds) extend far to the east below the surface. When making interpretation it is necessary to not forget how subsequent events may have altered the geologic record. We have spent some time developing the Taconic orogeny, not only because it is complicated, but also because it is a good example of what orogenies are like and how we interpret them. But with the Clinch/Tuscarora and the end of the Taconic a period of tectonic quiet settles into the Mid-Atlantic region, Stage I.